The terror, which would not end for another twenty-eight years - if it ever did end – began, so far as I know or can tell, with a boat made from a sheet of newspaper floating down a gutter swollen with rain. Now a Major Motion Picture, directed by Andres Muschietti and starring Bill Skarsgard as the story's central villain, Pennywise, and an ensemble of young actors including Finn Wolfhard (Stranger Things). 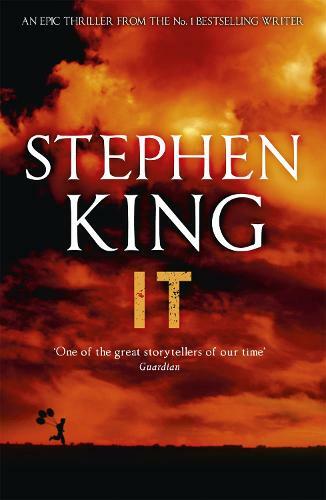 Known to many as the father of modern horror writing, Stephen King is the voice of the underbelly of small-town America for a generation of readers. Making his name as the author of cult classics (with an equally strong legacy of film adaptations) including Carrie, The Shining, The Green Mile, IT, The Stand, Pet Cemetery, Under the Dome and The Tommyknockers as well as the bestselling Dark Tower series. Its one thing for a film to scare you but to actually have nightmares and be scared of drains/under the bed at my age is just silly!